Before learning how to bake pork chops let us look at just what cut of meat this is and the different types of pork chops. Pork chops are comparable to steaks coming from beef cattle. There are different types, they can be cut in various thicknesses and you can buy them with the bone in or boneless. All these factors should be taken in consideration (To some extent) as to how you decide to cook them. Pork chops can be cut from center of the pork loin, from the rib section of the loin, from the shoulder end or leg end. The last two of these cuts contain much more connective tissue resulting in tougher meat and also being the least expensive. I am telling you this information because when learning how to bake pork chops, it will help you to decide what kind to buy. The thickness of the chops also plays an important part in this selection. Although all these cuts of meat can be quick cooked or they can be baked slower in the oven, I have my preferences. When you learn how to bake pork chops, you will probably find as I did, that the thicker chops are more suitable for baking. This thickness could be anywhere from ¾ inch to two inches; your recipe will probably instruct you to the best thickness. I prefer to quick cook the thin chops like frying, grilling or broiling. As you learn how to bake pork chops you will develop a preference to boneless chops or ones with the bone in. I really like the flavor of the ones cooked with the bone in but what I purchase depends on two factors. First, if I am cooking for guests, I prefer the boneless chops. The second factor is price; I always look for a good price on everything so I look for sales. 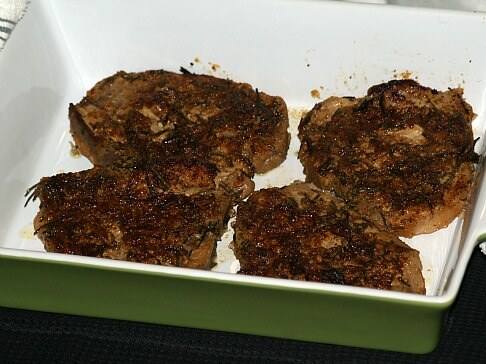 In a skillet brown pork chops; place chops in a baking dish. Drain oranges RESERVING liquid; measure ¾ cup liquid for recipe (Discard remaining liquid). Combine ¾ cup of the liquid with sugar, cinnamon, cloves, salt, mustard, catsup and vinegar; blend well. 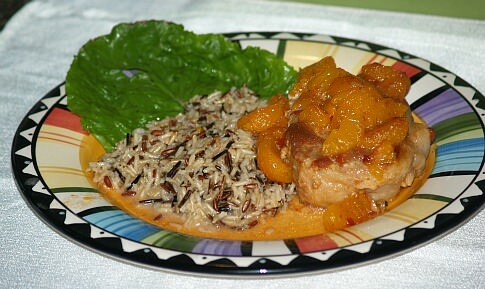 Place oranges on top of pork chops; pour liquid mixture over the top. Cover dish with foil and place in oven; bake about 40 minutes or until chops are tender. NOTE: Check chops after 30 minutes to make sure they do not get too dry. Uncover the dish the last 10 minutes to brown on top. Serves 5 to 6. Brown the chops in hot oil in a skillet; place in a shallow baking pan. Combine remaining ingredients and pour over the chops; bake for 1 hour. 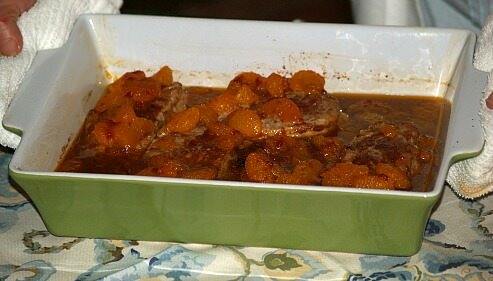 Brown pork chops in hot oil in a skillet; place in a baking dish. Sauté onions in skillet with drippings; add remaining ingredients to the skillet. Bring mixture to a boil; pour mixture over the chops. Cover dish with foil and bake for 90 minutes or until very tender. NOTE: Check chops after 1 hour to make sure they do not dry out. Combine in a large stainless steel or glass bowl mustard, vinegar, lemon juice and olive oil. Add garlic, rosemary, salt and pepper; stir to blend. Place pork chops in mixture turning to coat both sides; cover and refrigerate for 2 hours. 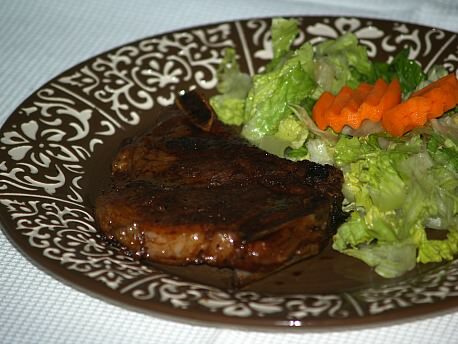 Remove chops from marinade; place in an oiled pan or baking dish; spoon marinade over the top. Bake about 45 minutes or until tender; turn chops over after 25 minutes. Preheat Butterfly each pork chop to form a pocket for stuffing. Combine hot water, melted and seasoning package from stuffing mix; stir to blend. Add stuffing mix, corn, bell pepper, onion, basil, pepper and water; stir until water is absorbed. Spoon stuffing into pockets of the chops; close pockets with wooden picks. Cover lightly with foil; bake about 45 minutes or until tender basting occasionally. Place chops in a shallow glass baking dish. Combine remaining ingredients and mix well; pour over chops. Bake chops in the marinade until tender about 50 minutes. 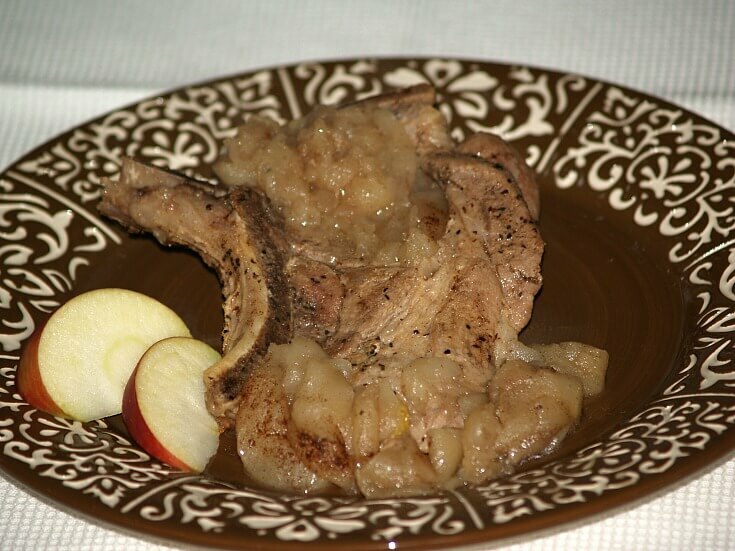 Learn how to bake pork chops with apples and sherry. Preheat oven to 350F degrees; grease 9X13 inch baking dish. Layer apple slices in prepared dish. 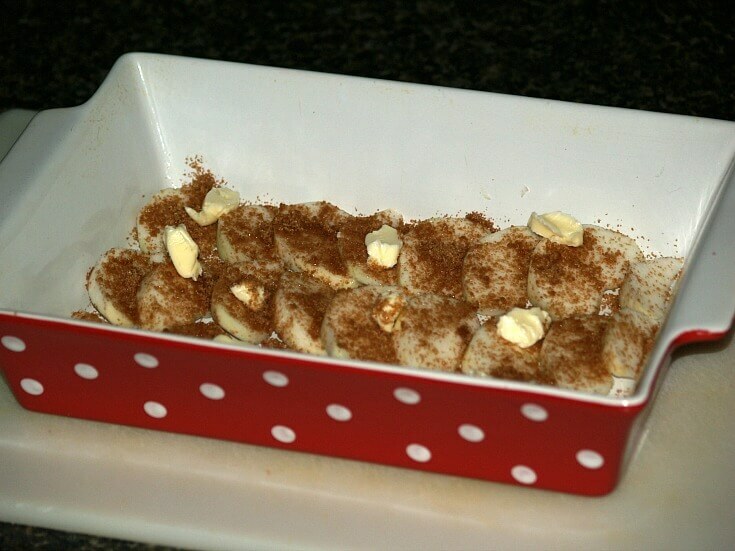 Combine and mix sugar and cinnamon; sprinkle over the apples. Dot apples with the butter; set aside. 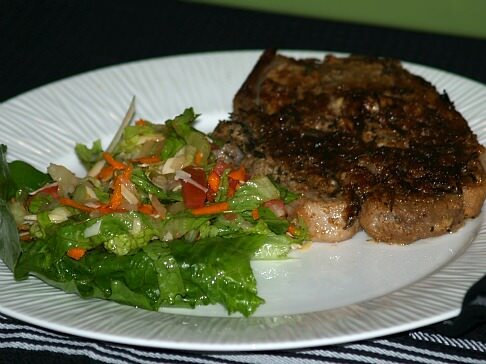 Heat oil in a large skillet and brown chops; place on top of apples. Sprinkle the chops with salt and pepper; pour sherry over all. Bake for 60 to 90 minutes; serves 6. 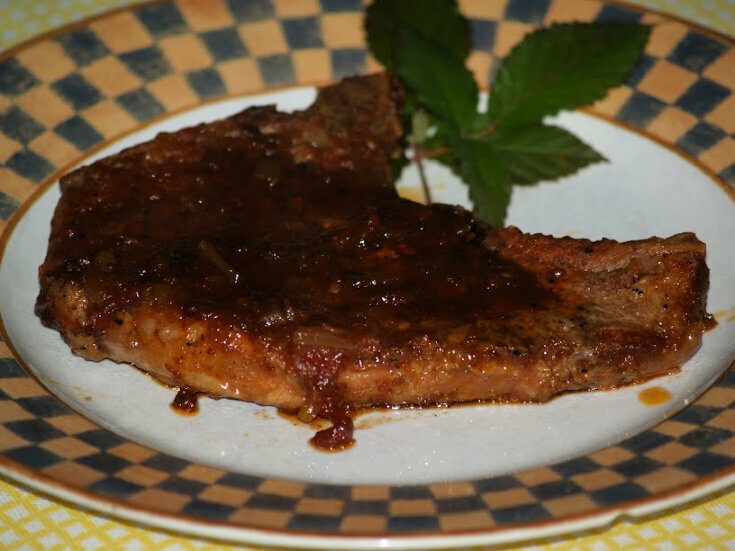 How to bake pork chops in barbeque sauce. In large skillet brown pork chops in hot oil; place in 9X13 inch baking dish. Combine tomatoes and remaining ingredients; spoon over the chops. Bake 45 minutes; serves 6. NOTE: * Ratatouille is a mixture of stewed vegetables; garlic, onion, zucchini, eggplant, tomatoes, peppers and seasoned with herbs. Season pork chops with salt, pepper and herbs. Brown pork chops in hot oil on both sides about 10 minutes on each side. Heat ratatouille and wine; place in bottom of ovenproof baking dish. Place browned chops on top of vegetables. Place ham on top of pork chops and cheese on top of ham. Bake about 10 to 12 minutes until cheese melts and is heated.